In the new issue of "Rich&Beautiful" you will find our A to Z fashion alphabet, tips on the outdoor workout with the fitness expert Remy Rippon. Exciting news on Audrey Soie, beautiful silk scrf creator and AJMAL, "daddy" in perfumes launches. You will also find tips how to pass a casting and kick off your model career from start. Alexa von Tobel, CEO of LeanVest and Author of Financially Fearless gives advices on money! 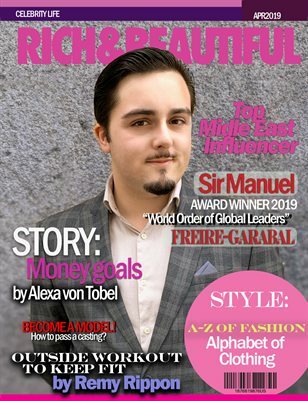 Our April Cover story is about Top Influencer of Middle East, Award winner 2019 of "World Order of Global leaders", Sir Manuel Freire-Garabal y Núñez. He shares tips on becoming successful and secrets of his personal style.